We know that a product could be assigned with multiple product categories from different product hierarchies. 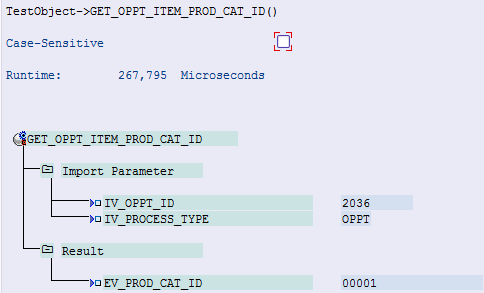 There are two ways to retrieve this category id starting from opporunity ( for simplity reason I only consider there is only one line item product for a given opportunity ) by ABAP code. Approach one: use BOL API. Input is Opportunity id and type, output is line item product category id. The source code of this approach could be found from method get_oppt_item_prod_cat_id. The BOL API call finally delegates to Genil implementation which calls corresponding function module to read the category. When I debug the function module, finally I find it is table CRMD_PRODUCT_I which serves this data request. Then it comes the second approach: direct OPEN SQL – whose source code could be found from method get_oppt_item_prod_cat_id2. CLASS-DATA so_core TYPE REF TO cl_crm_bol_core . ls_query_parameter LIKE LINE OF lt_query_parameter. CHECK lo_result->size( ) = 1. DATA(lo_bt_order) = lo_order_result->get_related_entity( 'BTADVS1Ord' ). CHECK lo_bt_order IS NOT INITIAL. DATA(lo_header) = lo_bt_order->get_related_entity( 'BTOrderHeader' ). CHECK lo_header IS NOT INITIAL. DATA(lo_items) = lo_header->get_related_entities( iv_relation_name = 'BTHeaderItemsExt' ). CHECK lo_items->size( ) = 1. DATA(lo_admini) = lo_item->get_related_entity( 'BTItemsFirstLevel' ). CHECK lo_admini IS NOT INITIAL. DATA(lo_product) = lo_admini->get_related_entity( 'BTItemProductExt' ). CHECK lo_product IS NOT INITIAL. EV_PROD_CAT_ID = lo_product->get_property_as_string( 'PROD_HIERARCHY' ). WHERE order~object_id = iv_oppt_id and order~process_type = IV_PROCESS_TYPE.